It's Sippy Monday!! And I made gin!! YAY!! It was suppose to be Sippy Sunday but well...roller derby. Enough said. So why is there no video? Well this seemed like something that would be better as a post than a video as this was a process that took 2 days so a written post seemed like a better way to go. Gin. I like Gin. Gin is my preferred spirit. Gin gin ginny gin gin. I'm also a lover of the martini which as you know is just vermouth and gin. And if anyone tries to tell you any different they're just wrong. A martini is gin and vermouth schluss punkt. Yes there are types of martini's. Dry, perfect, dirty, with a twist, vodka etc. Just remember just because something has a -tini suffix doesn't make it a martini. On more thing about martinis. Contrary to what Mr. Bond would lead you to believe martinis are stirred. Not shaken. Good rule of thumb, you stir drinks that are all alcohol and you shake drinks that are not. And in case you were wondering, there is a proper way to stir your cocktails. The more you know! Onward to my homemade gin. 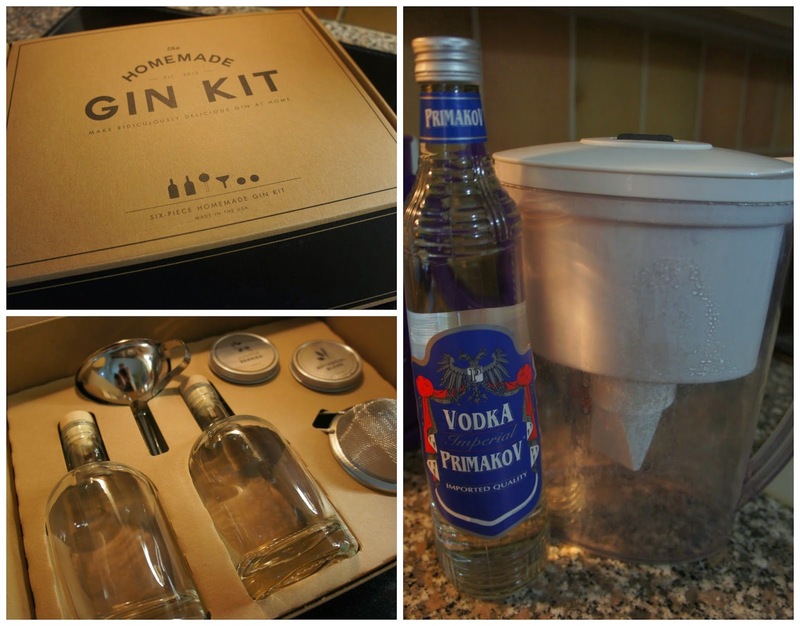 I picked up the homemade gin kit from a local store. It wast about 60 CHF...I think. I can't remember. I'll be honest I saw it and didn't think price I thought, "I NEED THIS!!" I do not recommend you make decisions this way. I triumphantly sent a text to John that I was now going to make my own gin. He said as long I don't wreck the bathtub in the process all was well. Another friend pointed out that when most people run out of gin they just buy some...they don't make it. Obviously I'm not most people. Now you're probably wondering why I have a brita pitcher next to my bottle of vodka. Well for this they recommend you use basic vodka. Don't go for the expensive stuff. Remember you're turning it into something else so you don't want to spend lots of money. Now I spent a whopping 10 chf on this bottle of vodka. Now let me be clear running your cheap vodka through a filter will NOT magically make it top shelf vodka. No. It will make it better. At the very least it will make it odorless. Trust me, 10 chf vodka as an odor. So I filtered my vodka a few times (like 5) before I put it in a bottle. Now you'll see from the kit above there are two cute bottles that come with it. That's for your end product. I used a larger separate bottle that I had in my cupboard. But you can just use the bottle the vodka came in. 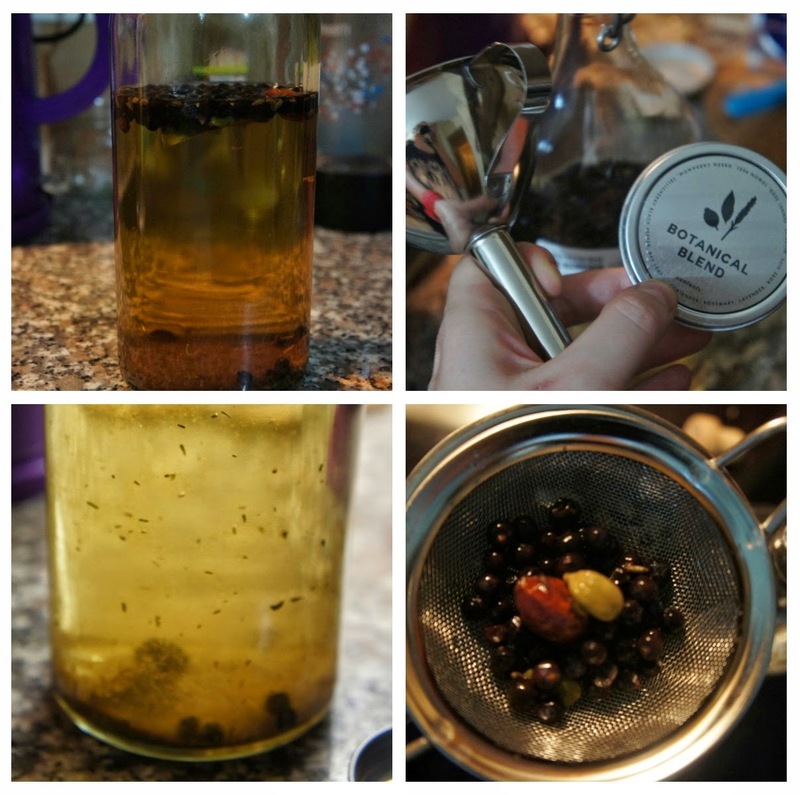 Add the juniper berries and wait 24 hours. Take it out. Admire the pretty gold colour and then add the stuff that comes in the botanical tin. Yes this is THAT easy. Wait some more. At LEAST 12 hours but NO MORE than 36. Mine steeped for about 24 hours. Give or take. Then we strained it through the little mesh strainer that came with the kit into the cute little bottles. I also then strained it through a teabag. Now that was a step I decided on by myself so I could have a clearer product but you can totally just leave it as is. Now I wasn't sure what to expect when I tasted it. John and I had been joking about going blind and perhaps calling it "Avec la baignoire". But I'm going to be super honest. It was tasty. Super tasty. If you are loyal to a certain brand of gin you'll know this isn't that kind of gin. But it's still really good. So good that I'm going to head back to where I bought the kit and buy a refill kit. I checked their website and they have a smokey refill kit as well which would be AWESOME. So what did I make with my gin. First I made a gin and tonic was a splash of St. Germain. 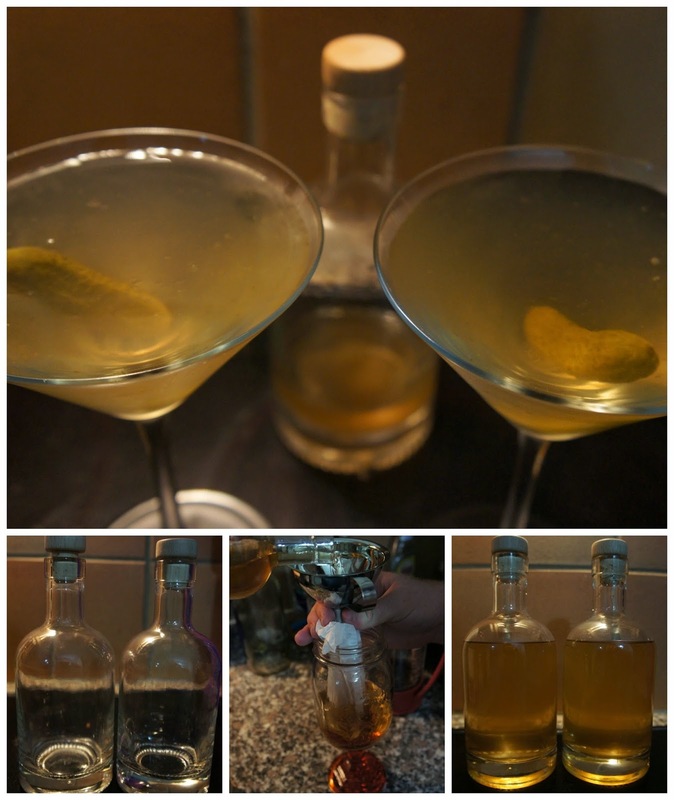 Then I made what has become a bit of a signature martini at our place. I made a dill pickle dirty martini. Yup, you read that right. Dill pickle dirty martini. Trust me. The thing to remember about this recipe this is how I like my martinis. Everyone likes their martinis differently. Some people like very little vermouth others like more. Experiment, that's the best way to find out how you like your martinis. Combine all items in your shaker. Add ice. Stir until the outside of your shaker is nice and frosty. Strain into (chilled) cocktail glass. You can double strain if you like (through your hawthorne and through a mesh strainer.) You can garnish with a wee pickle or a spear or a round or with nothing it's up to you. And there you have I made gin...and I didn't go blind in the process. Go me! !